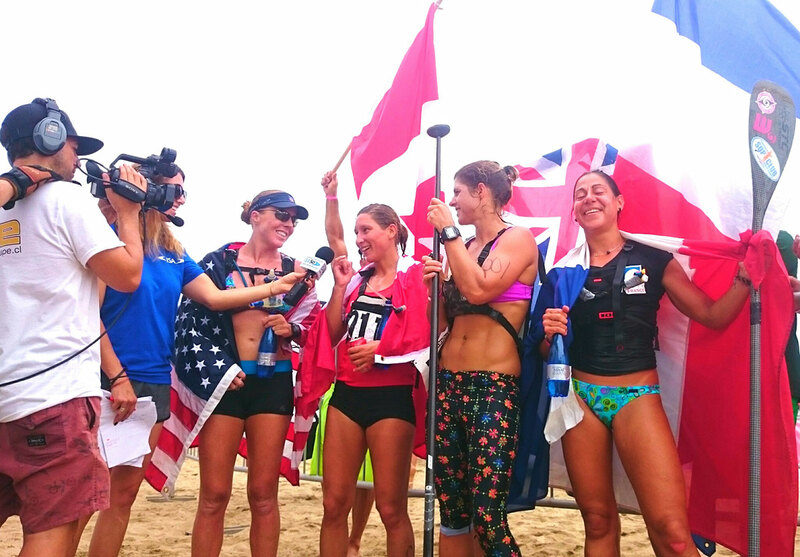 Candice Appleby has claimed the first gold medal of the 2015 ISA Worlds for Team USA, winning today’s Long Distance Race ahead of defending champ Lina Augaitis (Canada), Terrene Black (Australia) and Celine Guesdon (France). Candice, the reigning BOP champion, controlled the race along with Lina right from the start, before eventually pulling away to win by over two minutes. Terrene, along with New Zealand’s Penelope Strickland, stuck with the leading duo for most of the first lap, however on the second of four loops around the 4-5km course Candice and Lina stepped up the pace and broke free. For much of the 20km marathon it was a two horse race between Team USA and Team Canada. Lina started this race as a slight favourite, with Candice better known for her technical course style racing, however the American looked more determined and eventually broke her rival at the beginning of the fourth and final lap. Pea Strickland and Terrene looked safe in the battle for 3rd/4th, but a massive effort from France’s Celine Guesdson and Brazil’s Lena Ribeiro saw the gap close shut around the 13km mark (the race was advertised at 20km but based on times was probably closer to 17km, or just over 10 miles). Terrene, who was carrying the hopes of three-time defending champ Team Australia into this race, looked spent on the final lap, slipping down to 6th place and putting herself at risk of missing a medal completely. As the four women, sitting 3rd through 6th, came into the final inside buoy turns – this long distance course sent paddlers in and out through the waves on each lap – a set wave hit the pack and totally mixed up the order. Celine from France, who had put in a massive push to move into a clear third place and the virtual bronze medal position, was caught at the buoy by Terrene, after the Aussie snagged a wave on the outside and jumped three positions within seconds. Penelope and Lena from Brazil got cleaned up by the next wave, which shut down their medal hopes. Terrene held on over the final 300 metres to claim the bronze medal and some extremely valuable points for Team Australia, with Celine taking a very well deserved copper medal (unlike the Olympics, these ISA events go four deep on the podium). Team New Zealand claimed 5th and 6th went to Brazil, with both Penelope and Lena picking up a big haul of team points. But the big story today was Candice Appleby. The current world number two was in vintage form, fighting the whole way with a determined and committed performance, claiming the USA’s first racing gold medal since the inaugural Worlds way back in 2012. Candice’s win momentarily put Team USA on top of the teams leaderboard, giving them first blood in what is expected to be a very tight battle against the Australians in the hunt for the overall title. However just 10 minutes later, Australia squared the ledger after Jordan Mercer took her fourth straight ISA Distance Race gold medal. Jordie didn’t have it easy though, being pushed all the way by South Africa’s Anna Notten and Team USA’s Carter Graves. 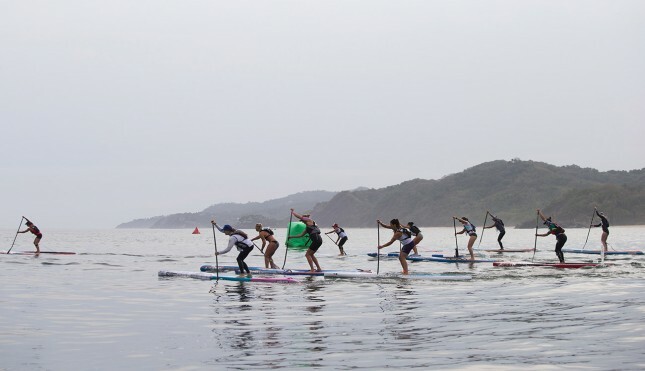 Anna and Jordie were actually side-by-side coming into the penultimate buoy, however a course error by the South African saw Jordie paddle clear for the win. Carter was also able to capitalise on Anna’s mistake and looked set for the silver medal, however Anna, to the great relief of her team mates on the beach, was able to reel in the American on the final sprint to the shore and claim a rollercoaster-ride of a silver medal. So at the end of Day 2, and with the first two gold medals decided, Team USA and Team Australia are tied for points atop the leaderboard, both holding 1,730 (out of a possible 2,000). As we predicted yesterday, this year’s teams title will be a three way battle between the USA, Australia and Team Hawaii. Check out our ISA Worlds: Predictions to see our picks for the overall team championship. Australia got lucky today: They could have easily finished 2nd and 6th but recovered to go even with the Americans. For much of today’s race it felt like the undefeated Aussies were being attacked on multiple fronts out on the water, however they survived the skirmish to put themselves in a strong position going into tomorrow’s men’s race. Though I think we all got the sense that the Green & Gold’s supreme dominance of this event is well and truly over. In the past, Australia has won by a landslide, but while the Aussies still have a good chance of going four-in-a-row, the leaderboard is going to be much closer than at any of the first three editions of the Worlds. Today’s top finishers received a roaring reception on the beach, however the biggest cheer of all was reserved for Argentina’s Florencia Baraboglia. Competing in this event against doctor’s orders (with a double shoulder injury), Florencia was determined to finish the race and gain valuable points for her team mate. Despite finishing in over three hours and taking last place, Florencia will be one of the most-photographed paddlers of the day. Paddlers from half a dozen other teams formed a tunnel of flags and cheered loudly as Florencia ran up the beach to the finish. It was a heart-warming show of camaraderie, and it highlighted exactly why the ISA Worlds are so special. This event is more than just a series of races, it’s a true festival that celebrates and grows the sport across the globe. Tomorrow we’ve got two more golds and plenty more team points up for grabs, with the men’s SUP and prone long distance race. The men have quite a lot to live up to, after today’s women’s race was more exciting than any of us expected. Distance races aren’t always the most entertaining affairs, however the ladies really put on a show out there this morning. 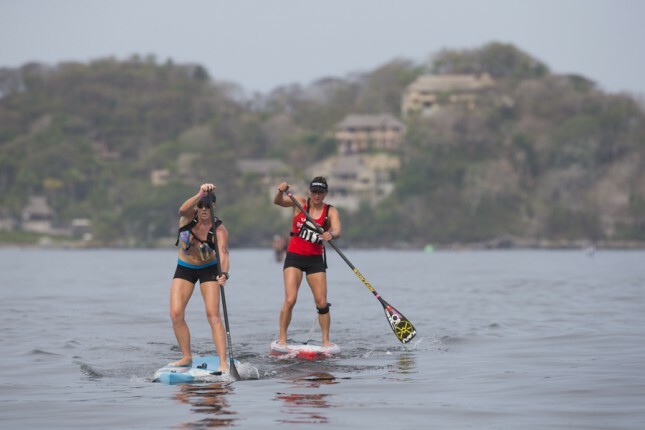 There will be 44x men tackling the SUP distance race course, including over a dozen of the world’s very best. We’ve got world number one Connor Baxter, world number two Danny Ching, Georges Cronsteadt from Tahiti, defending champ Titouan Puyo from France, Australia’s distance specialist Beau O’Brian, along with another 10 guys that will legitimately believe they can win a medal. It’s a stacked field. In fact, it’s going to be one of the most competitive races we’ve ever seen in this sport. We’re set to enjoy one hell of a race tomorrow, and you’ll be able to follow the action as it happens with our LIVE WEBCAST stream from 8:40am local time (“What’s the time in Mexico?”). For now, here are results from today’s classic encounter. Check back shortly for full results and photos.